Wanted is an SBS thriller drama starring veteran actors Kim Ah Joong as our multi-talented top actress Jung Hye In, Ji Hyun Woo as the intelligent and upright police officer Cha Seung In, and Uhm Tae Woong as the capable yet extremely sobering PD Shin Dong Wook. The drama wastes no time and establishes the premise of the story and our character’s relationships within the first two episodes. Our heroine Hye In’s son gets kidnapped on the day she announces her retirement from the entertainment industry, but the criminal orders her to set up a live reality show titled Jung Hye In’s Wanted and promises to return her son safely as long as she completes ten missions from him during the show. Hye In enlists the help of the only PD crazy enough to produce this outrageous show — Dong Wook, along with a few other trusted members: writer Yeon Woo Shin (Park Hyo Joo), director Choi Joon Goo (Lee Moon Sik), and assistant Park Bo Yeon (Jun Hyo Seong), to comprise the production team. 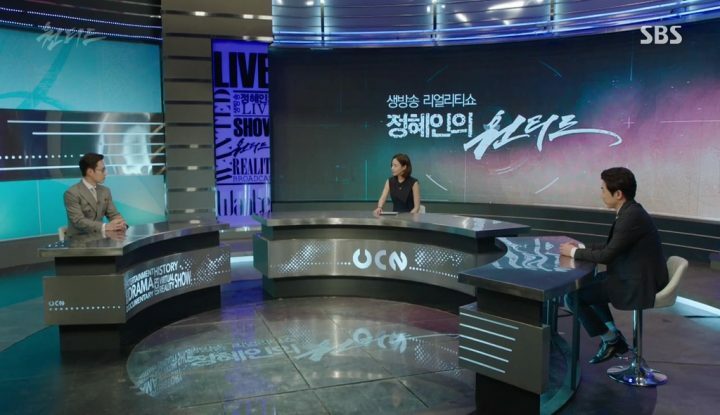 They then convince Hye In’s husband and cable network CEO Song Jeong Ho (Park Hae Joon) to allow the show to be aired. 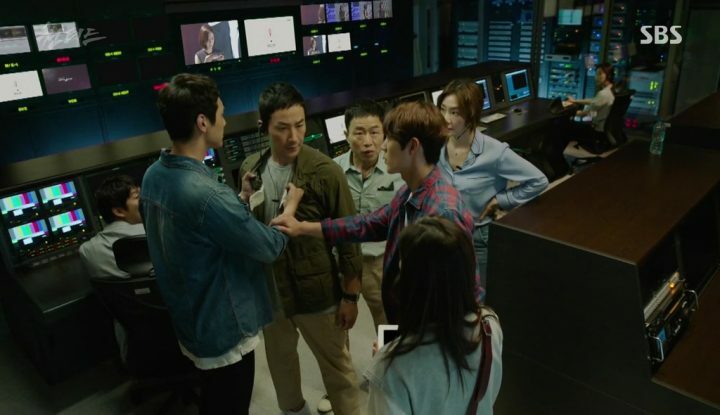 Meanwhile, Seung In and his young partner Lee Young Gwan (Shin Jae Ha) chases a separate kidnap case that leads them straight to the same clues as Hye In’s first mission. And so, our two separate storylines converge by episode two and we’ve got the complete production plus detective team in full pursuit of the show’s first target. What seems like an usual crime-solving detective storyline gets twisted and spiced up with an original and gripping setup that immediately drew my attention. Wanted‘s smart premise not only galvanizes our cast of characters to uncover the culprit’s true intentions, but also entices the viewers to await each episode’s new mission and the ultimate fate of Hye In’s son. In between the rapidly developing story, Wanted also does a fantastic job of peppering in dialogues and interactions that bring our characters’ complicated circumstances and true natures to light. They help provide motives and keep us guessing who around Hye In can truly be trusted. For example, it’s apparent right away that Hye In’s husband Jeong Ho is a shameless and ruthless business man capable of backstabbing anyone for his own benefits. 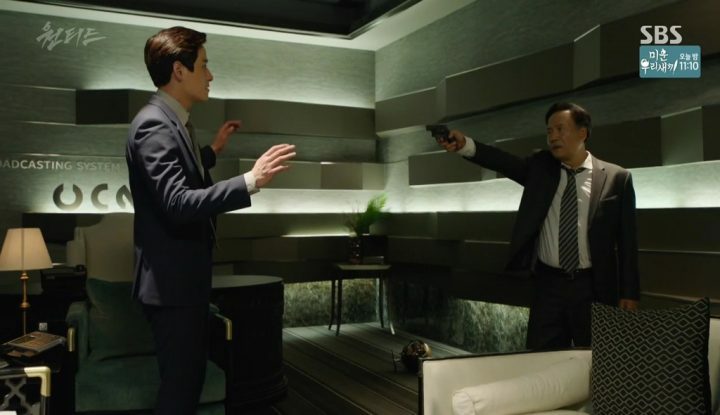 Dong Wook’s psychotic obsession to up the show’s ratings leads him to use increasingly provocative and questionable methods. 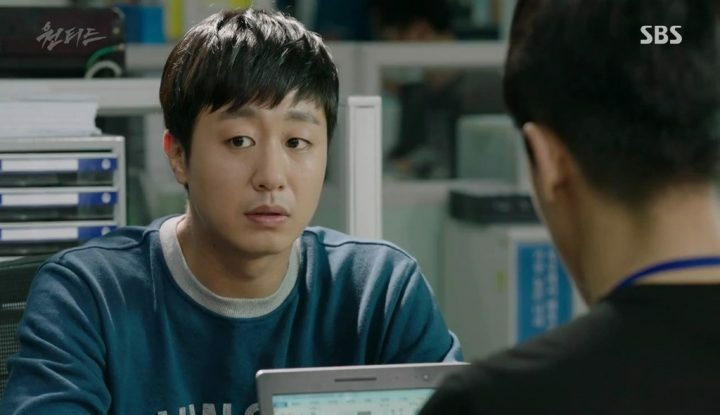 Even the snooping reporter who keeps digging round and Hye In’s mopey looking manager all seem suspicious enough to keep us on our toes. While we get lost in the drama’s intenseness and mysteries, Wanted does not fail to deliver twist after twist. Like a maze, the more paths you uncover, the more confusing it gets. One of the biggest surprises is that a few missions in, our heroes realize that the criminal is leading them to punish people who have done wrong, like a vigilante of sorts. But more importantly, there is a totally unexpected bigger conspiracy that the criminal is trying to reveal to the public via the reality show, by which all of his mission targets are related. With each mission, the web of connections between the targets multiplies and makes both the cast and the viewers desperate to find a common thread to make sense of all this. However, the side trying to bury the conspiracy is powerful, and efficiently cuts off potential threads one by one. This leaves our heroes no choice but to outsmart their enemy, and their enemy’s enemy. Beyond the ingenious setup and clever unfolding of events, Wanted does many things right. Beyond the ingenious setup, the clever unfolding of events, and intricate interconnections amongst the cast of characters, Wanted does many other things right to keep a firm grasp of its audience’s emotions. For one, it gradually dials up the provocativeness and visual eeriness of the missions, from child abuse to serial murders, keeping our eyes peeled to the screen and our hearts pounding. 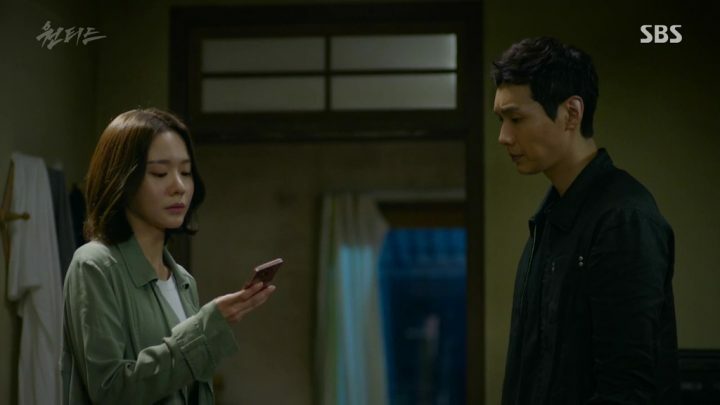 Also, the fact that Hye In gets closer and closer to her son creates anticipation and anxiety in the viewer, and a sense of massive disappointment when he narrowly slips through her arms. While Wanted is definitely one of the most intriguing and innovative crime dramas of recent years, it’s not without flaws. As intricately thought out as the plot is, it’s not airtight. A few of the target characters are hastily introduced and stupidly eliminated without convincing reasons. They serve their purpose of drawing out more clues for our heroes and are simply tossed away with futile planning. Furthermore, it seems implausible at times that criminal faces revealed on a reality program watched by more than 30% of the country’s population can still get around in broad daylight without being noticed or reported. Though these inconsistencies don’t damage the bigger story much, they do make you raise an eyebrow at times. But my biggest complaint of Wanted is the unconvincing emotional delivery towards the crux of the issue from the entire cast. Or rather, it’s not due to incompetence of the great group of actors, but that the drama focuses too much on chasing clues and completing missions that most of the time, you forget Hye In’s son’s existence. He’s the sole reason this entire show exists, yet no one seems to care all that much about his safety, or given the appropriate time to reflect on it, not even Hye In at times. So while I’m 100% invested in the drama from a mystery solving perspective, I feel little emotional attachment and empathy for Hye In’s dire situation. In any case, if you’re fond of complex crime cases, enjoy deducing who the bad guys are, and like a bit of adrenaline pumping graphic intensity, then you’ll definitely want to be a part of this whirlwind reality show, in pursuit of the truth hidden in the dark shadows. But be warned, Wanted is not for the faint of heart.